Materials and Care: 100% synthetic. Hand wash only. 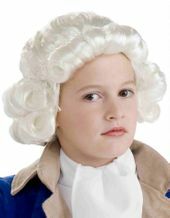 Be the most stylish gent at the Continental Congress in our child's colonial boy costume! Great for George Washington, Thomas Jefferson, or even King Louis XVI of France, this boys' colonial costume include a long royal blue coat with gold trim, tan vest front with attached white jabot collar and ties in the back, and beige knicker pants with elastic at the knees. Wig, shoes, shoe buckles, and knee socks sold separately. 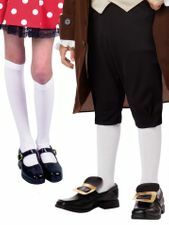 See more options in our Colonial Costumes and President's Day Costumes departments!